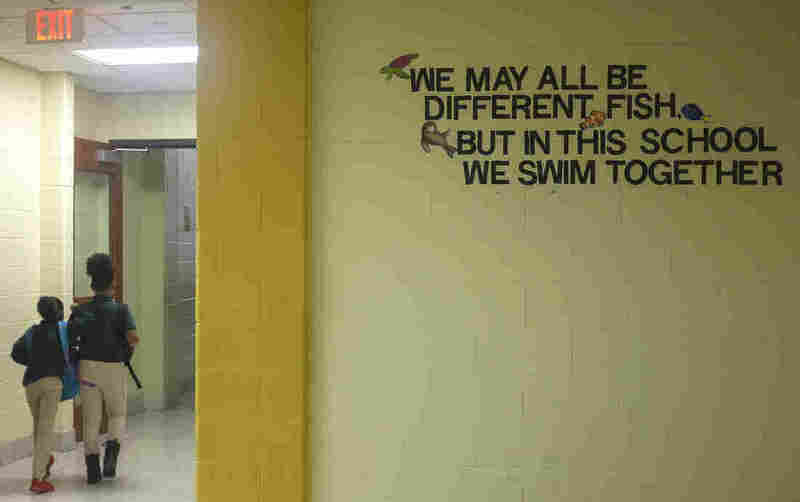 Some Schools In New Orleans Are Moving To Trauma-Informed Discipline To Help Traumatized Students : NPR Ed Children in New Orleans suffer from trauma at high rates. Now, several schools there are focused on catching and helping students whose behavior may be a response to their suffering. If you know anything about New Orleans public schools, you probably know this: Hurricane Katrina wiped them out and almost all the schools became privately run charters. Many of those schools subscribed to the no excuses discipline model — the idea that if you crack down on slight misbehavior, you can prevent bigger issues from erupting. That was also true of Crocker College Prep, an elementary school in New Orleans. It had strict rules about everything. Students had to sit up straight at their desks, eyes tracking the speaker. They had to walk the halls in silence and even wear the right kind of socks. Students who broke these rules, or acted out in other ways, were punished. The thing is, students across New Orleans face high rates of exposure to trauma, but school discipline policies have rarely accounted for that. The Institute of Women and Ethnic Studies found that kids in New Orleans screen positive for post-traumatic stress disorder at more than three times the national rate. The institute also found that up to half of all kids have dealt with homicide in some way, with 20 percent actually witnessing murder. And then there's the city's high poverty rate — about 40 percent of kids living below the poverty line. The state's high incarceration rate means many children have a parent behind bars. 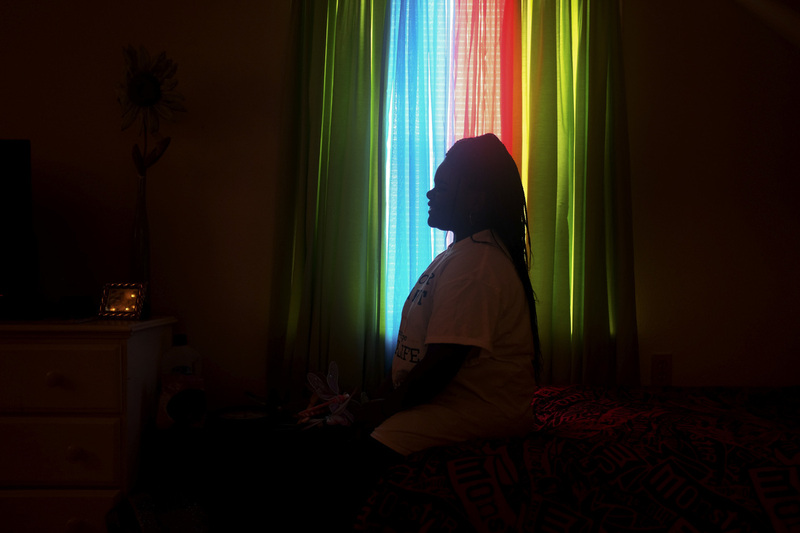 "Generally there just was really not an understanding of how trauma impacts a child," says Paulette Carter, president and CEO of the Children's Bureau of New Orleans, a mental health agency for kids and families. "Teachers and school staff really look at children through the lens of, 'What's wrong with that child?' Versus, 'What happened to that child?' "
Carter says schools, because they have so many children dealing with many different issues, often don't think about the reasons behind behaviors. Mental health workers, like her, though, have learned a lot recently about how trauma changes the brain. "A kid who's been exposed to trauma ... that fight or flight response is much more developed and stronger," Carter says. 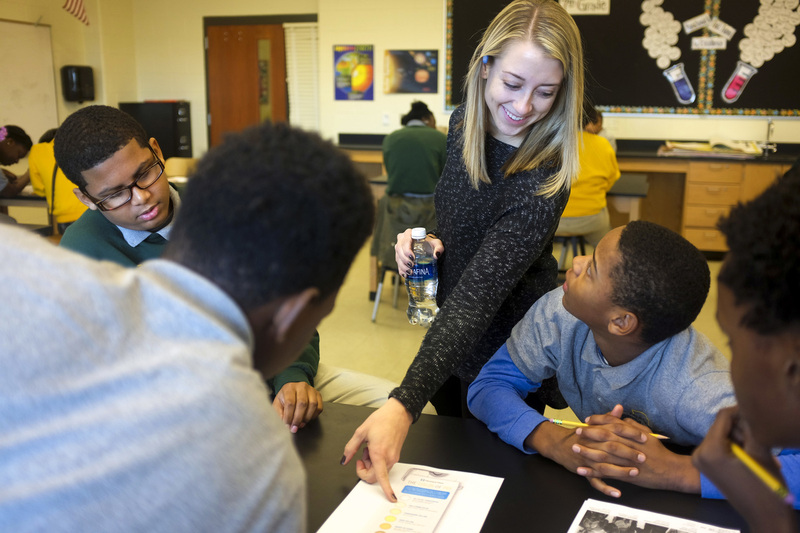 Katie Murray starts most school days with a social-emotional learning curriculum for her 7th grade class. "If I'm walking down the hallway and somebody bumps into me, and I don't have a significant trauma history, I'm gonna say 'Oh, sorry, excuse me,' " she explains. "Whereas a kid who's been exposed to trauma on an ongoing basis, if somebody bumps into them that might be a threat." From there, she says, the survival brain kicks in and reasoning and logic shut down. Crocker has developed ways to help students who are dealing with those experiences. Two full-time social workers hold one-on-one sessions with students who need someone to talk to. Teachers send disruptive students to a room called the wellness center for a meditative time-out that's not supposed to be punishment. Sherlae stands in her bedroom and digs through a desk drawer. It's filled with pencils and Sharpies. They're some of the 13-year-old's most cherished possessions, because Sherlae, who goes to Crocker College Prep, loves to write. She fills thick, spiral notebooks with song lyrics and original poetry. "Most of the time I write my poetry on my bed because it gives me a lot of thoughts right there," Sherlae says. We're using Sherlae's middle name to protect her privacy. A while back she says her mom stormed into her room, grabbed all her school work and writing, and threw it in a dumpster down the street. She opens another desk drawer, stuffed full of paper. "I save all my writing in here," she says. "Because I don't want my mom to throw it away." Sherlae says sometimes her mom is great. She'll take her swimming, or riding bikes and they'll have a "sunshiny day." But there are times when her mom goes off her medication, or drinks too much. "She just turns into a different person," Sherlae says. "And it's like, 'Do I even know you anymore?' "
Sherlae's grandmother, Marie — whose middle name we're also using — has been watching her since she was 3 years old. They're close. Sherlae is in seventh grade at Crocker College Prep. She used to put her head down on her desk at school and keep emotions bottled up inside. Then she started meeting with a school social worker. Marie says that a few years ago, Sherlae and her mom were evicted and her mom began cycling in and out of jail. That's when Sherlae's grades started to drop. We reached out to Sherlae's mom, but she declined to speak with us for this story. Some children respond to trauma by disrupting class, starting fights, storming out into the hallways. But when Sherlae's upset, she completely shuts down. "When you should worry about me is when I'm not paying attention in class," she says. During those times she says she's thinking about her mom. "Why is she doing this and why is it happening to me?" At Crocker, Sherlae gets help. "I think she's a really easy kid to just fly under the radar," says Rochelle Gauthier, one of two full-time staff social workers at the school. "Because she's not a behavior problem. She's not causing a lot of disruption." But Sherlae was hurting. She had to repeat the fourth grade. Her grandmother asked the school for help and Gauthier was assigned. "I went and pulled her from class, introduced myself, brought her to my office," Gauthier says. When you should worry about me is when I'm not paying attention in class. Sherlae remembers that day, too: "She was just wondering, like, what makes you sad when you're in class? What makes you not focus in class? What makes you not be happy?" The two set up regular appointments. They'd talk through feelings and come up with coping mechanisms, like writing poetry. "You know, really sadly, kids who struggle with serious depression, who fly under the radar, can end up in the hospital for harming themselves or potentially dead as well," Gauthier says. That's something Sherlae says she's thought about. "My depression about my mom got to the point where one time I said I wanted to hurt myself." She'd had an extremely painful interaction with her mom. "She said she didn't want me around. Like she was saying that she didn't want me in the world anymore and stuff like that." Gauthier made her sign a contract promising she wouldn't harm herself and got her into more intensive counseling. Crocker makes an effort to catch quiet kids like Sherlae. Teachers fill out a form for each student, noting things like whether they get easily distracted or seem overly nervous. Teachers also track students' behavior. If they notice a big change, they can tell a social worker. And teachers are now trained to recognize signs of trauma. Sherlae is still dealing with trauma. But, "after three years of getting lots of counseling and support, I'm noticing, even as those situations continue to happen at home, she's developed so many strong skills and has a support network that it's not affecting her as much as it to used to," Gauthier says. Last spring, after years of bad grades, Sherlae reached into her purple backpack and surprised her grandma with a great report card. She wants to keep up the good work, but she knows it's up to her to stay steady. That report card was one of the things her mom threw in the trash. It's a Wednesday morning at Crocker College Prep and Principal Nicole Boykins is posted up on the second floor hallway. Every few seconds she calls to kids to tuck in shirts, to stop running. Then a teacher walks up with third grader. The student is fuming. "Shane, what's up?" Boykins asks. He mumbles that he doesn't want to be in class. Rochelle Gauthier is there in the hallway, too. She reminds the boy of some recent success. "We just had a great outing on Friday. We got to go to the basketball game and do all that because you had two good days." Nicole Boykins is principal at Crocker College Prep in New Orleans. The pre-K through eighth grade school is one of five schools in a program to better serve children who've been exposed to trauma. The encouragement doesn't work. Shane runs into the stairwell. Boykins goes after him and gets on a school walkie-talkie, asking for help. "Shane has been struggling," she says, describing a meeting just days before between herself, a social worker, a student dean and Shane's mom. "Mom thinks Shane is struggling because dad was just sentenced to 20 years," Boykins says. While in jail in New Orleans, awaiting sentencing, Shane could visit his father. But the sentencing meant he was transferred to a prison many hours' drive away. "And now we're struggling significantly," Boykins says. This kind of work takes a lot of energy. Three or four staff members might tag team to help one troubled student on any given day. Boykins might spend half her work day working on behavior. I could give him a 30-minute lunch detention, but do you really think that's going to remedy what his issues are? She started as a first grade teacher at Crocker. Now she's in charge of about 550 pre-K through eighth grade students. 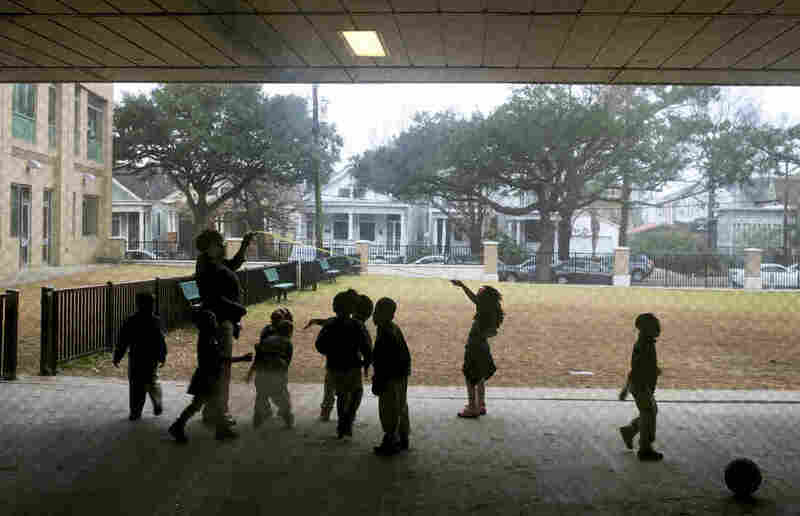 Since Katrina, it's become rare for school leaders to be from New Orleans. Boykins grew up in a neighborhood called Hollygrove, known for patches of violent crime. She says no one talked to her about being a good student or going to college. "Being from New Orleans, I've experienced a certain level of trauma," says Boykins, "whether in my own home or outside the door." She credits coping skills learned at an early age with her success in school and her ability to take on this job. "Nothing really rattles me." She was the middle child, with an older and younger brother. As a kid, she got into a magnet school for junior high and high school. She became the first in her family to graduate from college and then went on get a master's degree in education. She can't really tell you how she did it, other than saying she kept her head down and worked hard. 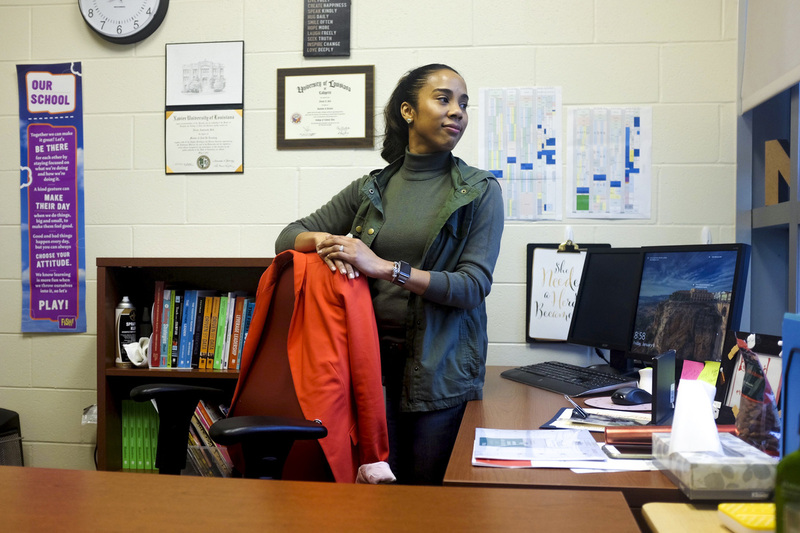 As principal at Crocker, though, she has had to get specific about what coping skills are, how to foster them in her students, and what each child needs. "A lot of times teachers want students punished because they say you've wronged me as a teacher," says Boykins. "But remove yourself from the situation and think about what that student needs. Even the students who give teachers the most grief want to be here." She describes a student who walked from Elysian Fields Avenue to get to Crocker, a several mile walk. "I could give him a 30-minute lunch detention," says Boykins, "But do you really think that's going to remedy what his issues are? ... He walked miles to get here. Why?" Boykins keeps in mind the disproportionate number of black males in New Orleans who get incarcerated. On her bulletin board, next to inspirational quotes and a picture of her own young son, she also keeps a letter from her brother. It's post-marked as inmate mail from Bossier Correctional Facility where her brother went about a year ago. The letter included a list of strict regulations at the prison. Boykins reads it to students, along with excerpts from the letter.
" 'As for me, I'm hanging in there,' " she recites from the page. " 'This place where I'm at is so intense. It's set up so you give up, but I can't let them get me.' "
This story was reported with support from the Center for Health Journalism.